From a height of some 50 metres, you have the entire ITER worksite at your feet. The long rectangle of the Diagnostics Building stands out in the centre, with walls that now rise two storeys above platform level. Concrete pouring is underway in the upper corner; while on the opposite side metrology teams are carefully verifying the precise position of rebar and embedded plates. The circular structure of the concrete bioshield, to the left, is best seen from a height. The basement levels are partially hidden in shadow; the second above-ground level (L2) is not yet fully realized. In the foreground, hundreds of embedded plates catch the last rays of the setting sun—this is the location for ITER's giant neutral beam injectors. Let's now move to the right. Partially eclipsing the Poloidal Field Coils Winding Facility (red trim), the metal structure of the cryoplant has received the first elements of its metal "skin." Toward the end the cladding phase, the building will look like the Assembly Hall, with alternating panels of mirror-like stainless steel and grey-lacquered metal. In front of the cryoplant, rows of concrete columns are now in place for the twin Magnet Power Conversion Buildings. 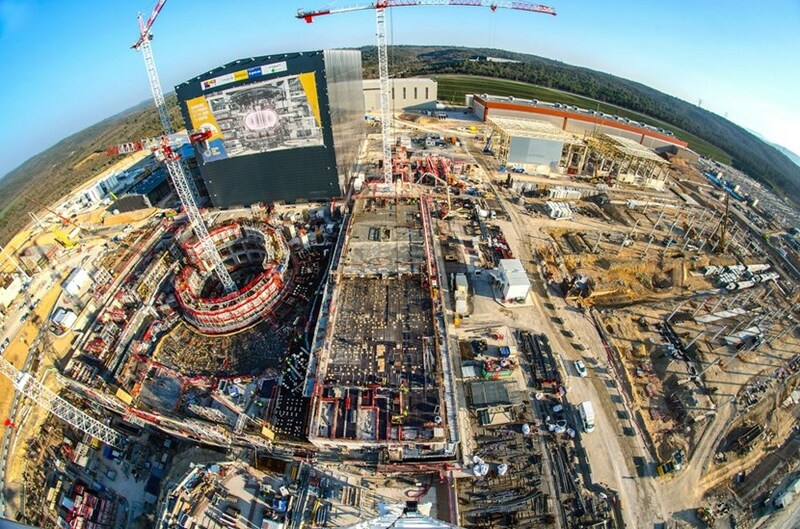 From the depths of the Tokamak Complex to the cabins of the tall cranes, more than 1,500 workers are now contributing to the construction of the ITER scientific facility. They are the builders of a world that has no equivalent elsewhere.